TALLAHASSEE, Fla. — The waters around Florida are known as a Mecca for tropical and exotic fish, but there’s one sea creature that’s no longer welcome along our shores: the invasive lionfish. According to the Florida Fish and Wildlife Conservation Commission (FWC), the lionfish was first introduced into Florida waters in the late 1980s, with populations booming in recent years, negatively impacting native wildlife and habitat. As such, FWC has instituted several rule changes that went into effect on August 1, with an eye toward fixing the growing problem by limiting further introduction of the species into local waters and making it easier for lionfish hunters to remove the spiny predators. • Participants of approved tournaments and other organized events will now be permitted to spear lionfish or other invasive species in areas where spearfishing is not currently allowed (such as certain state parks or refuges). This will be done through a permitting system. 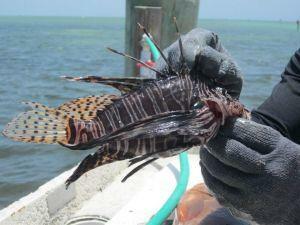 The FWC is also looking for the public’s help in identifying lionfish in the wild. Have you seen one? You can report a sighting at this page, or by using the new Report Florida Lionfish app available for both the iPhone and Android platforms. Happy hunting.